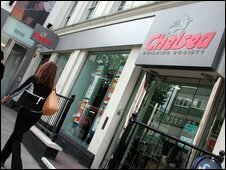 The Chelsea Building Society has revealed it has lost £41m ($67m) as a result of mortgage frauds involving some of its buy-to-let loans. The frauds are the main reason for the society staying in the red, with overall losses of £26m in the first half of the year. The frauds appear to have involved professionals colluding to inflate the value of buy-to-let properties. The society says the losses emerged after a review of all its loans. "The society has been through a difficult period and reporting a loss in the first half of the year is disappointing," said Stuart Bernau, the Chelsea's chairman and interim chief executive. "However, the underlying performance is strong, even though we have had to make provision for impairment and fraud losses." Last year, the Chelsea lost £39m, the largest annual loss yet recorded by any building society. Its chief executive agreed to resign earlier this month. The Chelsea explained that the potentially fraudulent loans it had discovered were mainly among buy-to-let loans made between 2006 and 2008. It said they were mainly due to "the artificial inflation of property values by third-party professionals involved in the transactions", such as mortgage brokers and surveyors. "This is not a massive number of individuals," said Jeremy Hicks, a spokesman for the society. He said it had decided to review all its mortgages after losing money with Icelandic banks last year, and had discovered some mortgages that fitted the profile of potential fraud cases. As a result, the society concluded that it had to set aside £41m in case the suspect loans were crystallised as cash losses. A team of 12 to 16 people are now going through these cases individually to see if fraud has been committed. "This could take some time," Mr Hicks said. In many of the cases, people are consistently making their repayments, and will be unaware that their home had been valued at more than it was worth. Nobody has been prosecuted to date, but if evidence emerges, the building society will report this to the relevant authorities. Mr Hicks added that other building societies would find they were in a similar position if they carried out a similarly thorough review of their own lending. Earlier this month the now nationalised Bradford & Bingley said it had set aside a further £100m to cover itself against losses from mortgage fraud and "professional negligence" on its loans. This brought to £271m the amount it has set aside for these problems since the start of 2008, with the lender saying it had hundreds of cases of potentially fraudulent mortgage applications to resolve. The Chelsea stopped making any new buy-to-let, sub-prime, self-certification or commercial loans at the end of last year. Ray Boulger of mortgage brokers John Charcol said the Chelsea had not in fact been a big player in buy-to-lending lending. "It wasn't particularly big in that market, the niche area it was most well known for was sub-prime lending." Mortgage lenders have been aware for some time of the heightened threat of fraud associated with buy-to-let and newly built properties. At the beginning of 2008 the Council of Mortgage Lenders (CML) warned that products such as "cash-back" deals might exaggerate the apparent market value of a house or flat. The FSA then told lenders to tighten their defences against fraudulent mortgage applications, typically from dishonest mortgage brokers. And new rules came into place last September for the conveyancing industry to prevent builders and developers inflating the value of their properties. The Chelsea is the fourth largest building society in the UK, with 606,000 savers and 34 branches. Mortgage arrears and falling house prices led the Chelsea to write off a further £12m in the first half of 2009, in addition to the money set aside for the mortgage fraud. Its directors said the society was "comparatively well-placed" to deal with the problems of potential further losses and the difficulty of attracting savers, amid fierce competition from other societies and banks. But the directors said they would "continue to review the strategic options available to the society", a phrase often used by managements when they are considering seeking a buyer or a merger partner.